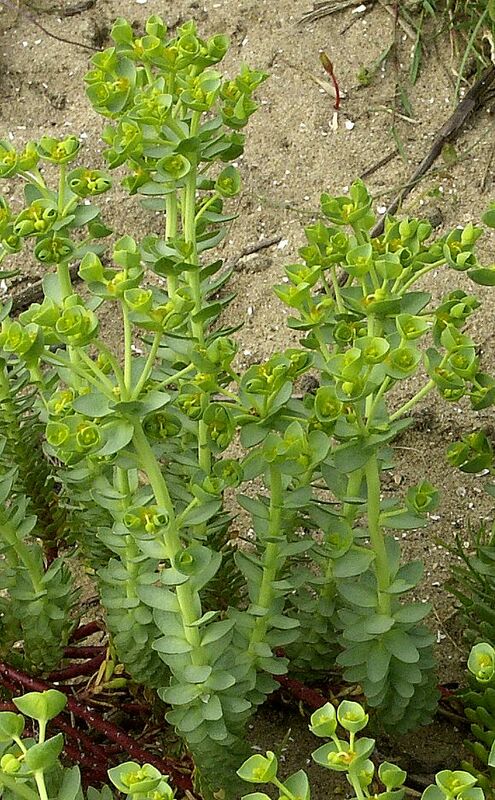 The Spurge Family is very distinctive, with most possessing three-fold fractal symmetry in the flowers heads. 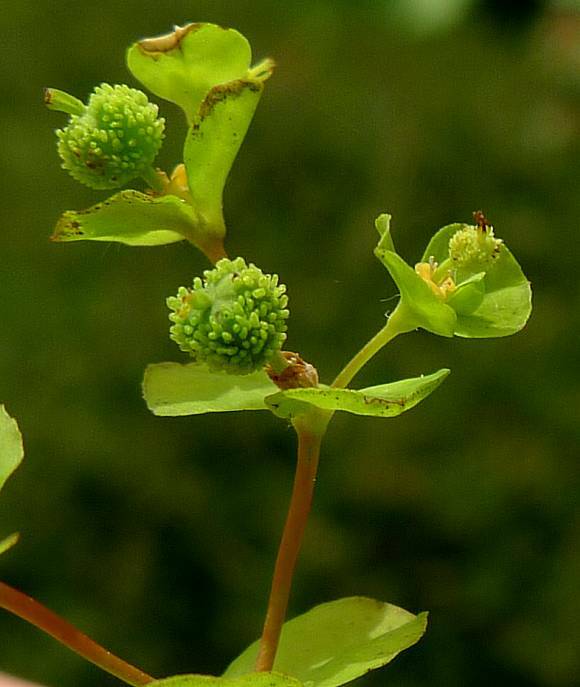 Most also have a very poisonous milky sap which exudes from the stems when they are broken and which is capable of inflicting dangerous skin wounds or dermatitis. Dandelion (Taraxacum officinale), Russian Dandelion not to be confused with Russian Lettuce] (Taraxacum kok-saghyz) which was once used as a source of natural rubber when the latex from the Rubber Trees was in short supply during the war, Guayule (Parthenium argentatum) and Scorzonera tau-saghyz. Apart from Dandelion, none of these are native to the UK. 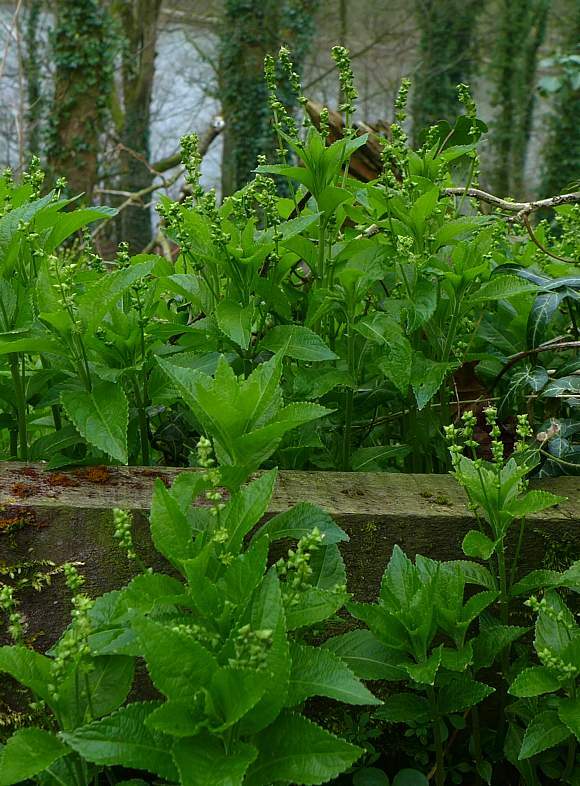 The Spurges, or Euphorbs, are typified by eight or more series of mostly irritant and toxic diterpenes and their esters. Many have a cyclo-propane ring, which is highly strained and therefore liable to break under the right circumstances, creating a reactive radical. 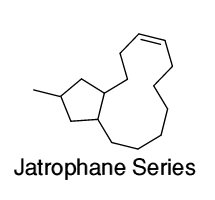 This must be partly responsible for some of the toxicity of these compounds, but certainly not all, for the most toxic Daphnanes lack this cyclo-propane unit. The family resemblance between the five series, the Lathyranes , the Jatrophanes , the Tiglianes , the Daphnanes and the Ingenanes clearly shows in the diagrams below. There are a few more series that are present in some of the Spurges, including The Segetane Series, the Pepluane series and the Paraliane series. Further series are known about. Various Spurges have differing combinations of these series, which engenders differing Spurges with differing corrosiveness and toxicity. 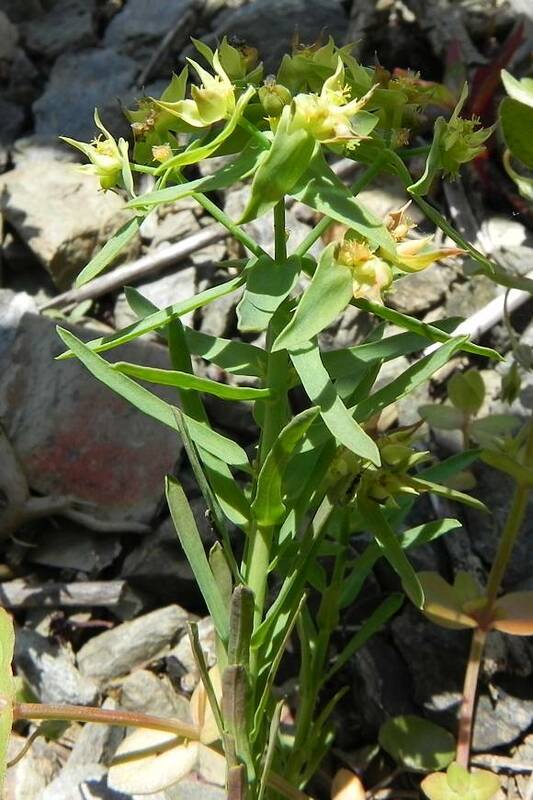 The most toxic Daphnanes are typified mostly by those synthesized within Mezereon (Daphne Mezereum), which is not a Spurge. 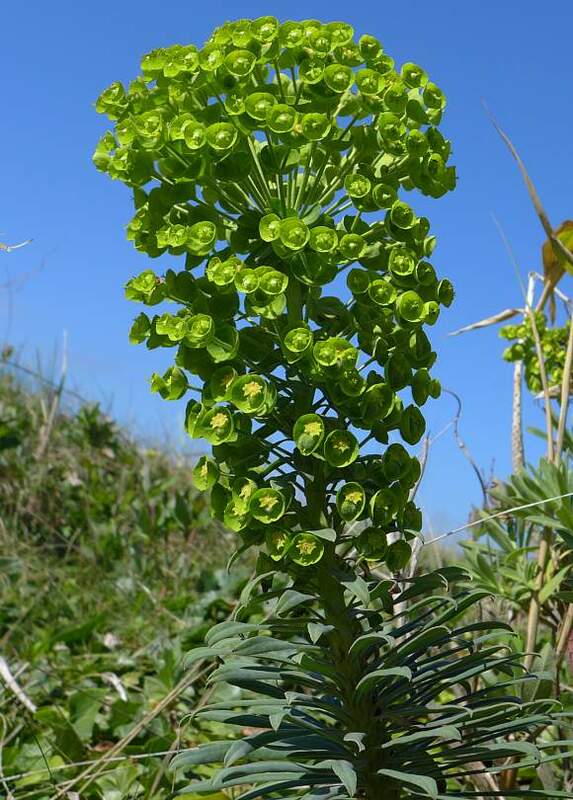 All Spurges are monoecious with separated male and female flowers. Comprising just one female flower and a few male flowers all nestled into a cup-shaped 'bowl' or cyathium. 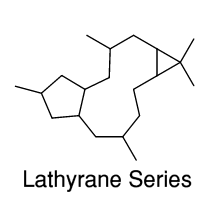 The Jatrophane Series (first found in the non-native species Jatropha) are similar to the Lathyrane Series but with an extra carbon atom in the large ring and lack the cyclo-propane ring. 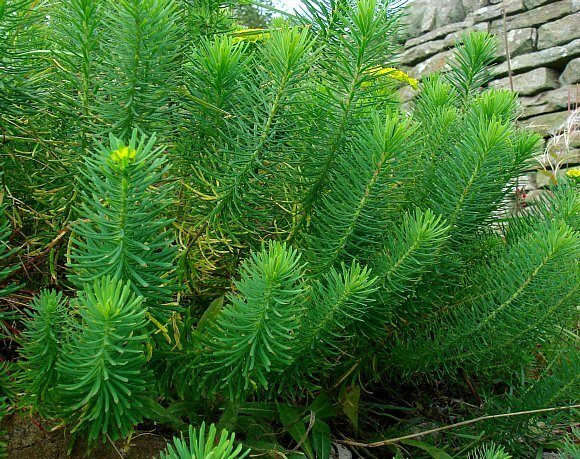 Missing this energetic ring, these compounds do not illicit skin irritation. Jatrophanes exhibit microtubule binding activities similar to those induced by Paclitaxel, further research is necessary. 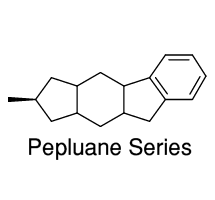 The five series are all derived from the pre-cursors, the Lathyranes, which have an incompleted ring but possess the energetic cyclo-propane ring. Apart from a missing bond, they already possess the polycyclic structure of a three-membered, five-membered, seven-membered and a six-membered ring structure of the whole series. 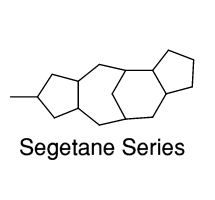 In the Ingenane series, the six-membered ring has become a second seven-membered ring by straddling the resident seven-membered ring. 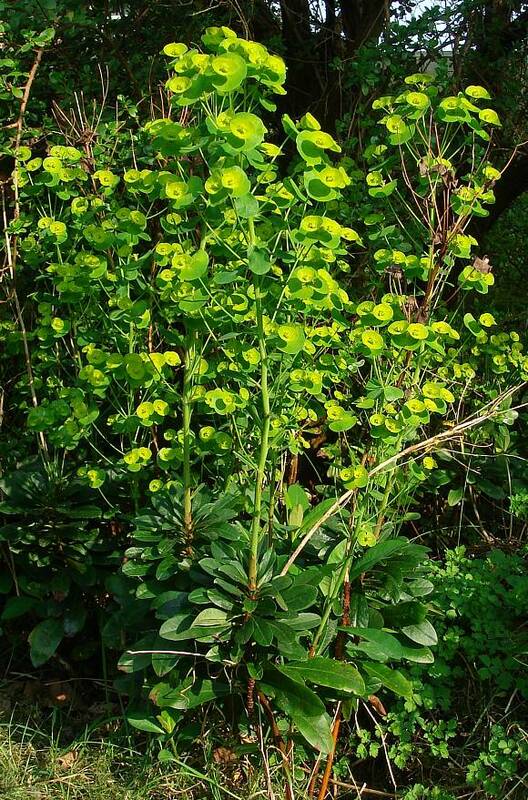 The lathyrane series obtain their name from the plant Euphorbia lathyrus (Caper Spurge) where they were first found. 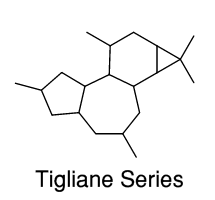 The Phorbol esters found in most Euphorbs are based on the Tigliane Series. These have many hydroxyly groups attached around the rings in various places, conferring various toxicities to the compounds. They too have the cyclo-propane ring. 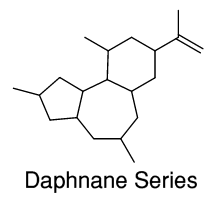 The Daphnane Series lack the cyclo-propane ring and have a propene group attached at carbon atom number 13, but this does not make them less toxic. It can be seen that the Daphnanes are identical to the Tiglianes but where the cyclopropane unit has broken the lower bond. Some of the Daphnanes exhibit the most irritant properties of any chemicals in the plant world: Mezereon (Daphne Mezereum) being one of those plants. 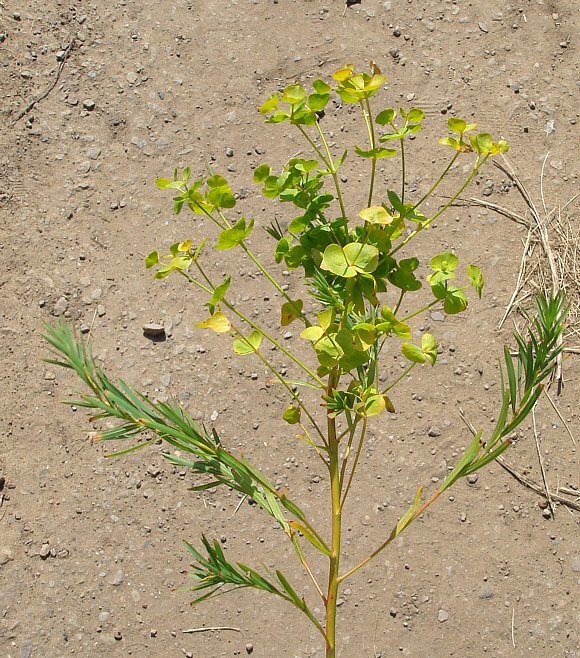 Huratoxin is a daphnane from the (non-native) Sandbox Tree. 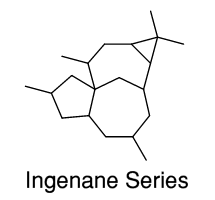 The Ingenane Series are slightly different in having no six-membered ring and instead two seven-membered rings. They still retain the strained cyclo-propane 3-membered ring. The molecule is highly strained and non-planar, being somewhat twisted and because of this adopts either the cis- or trans-conformation. Similarly, not all ingenanes are found in Euphorbs; Milliamine A is an ingenane produced in the Crown of Thorns , a starfish. 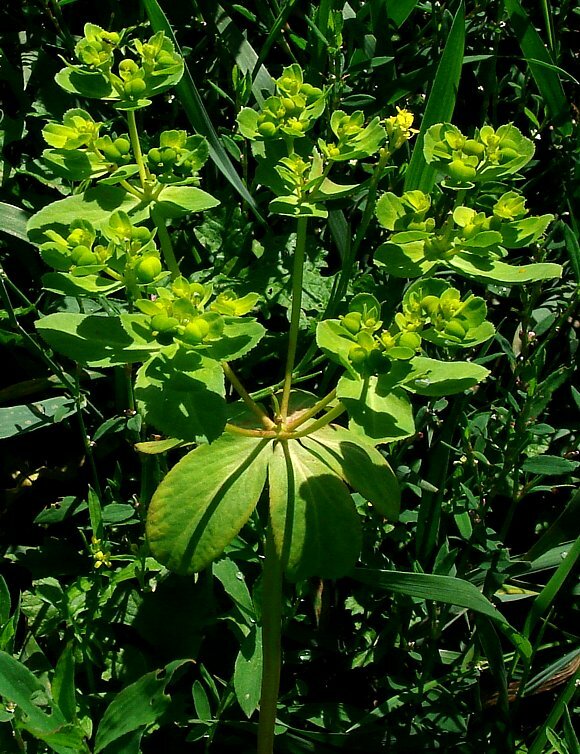 The Segetane series are rare diterpenoids recently found in Sea Spurge (Euphorbia Paralias) and have fused 5-, 7-, 6- and 5-membered rings. They lack the cyclo-propane unit. 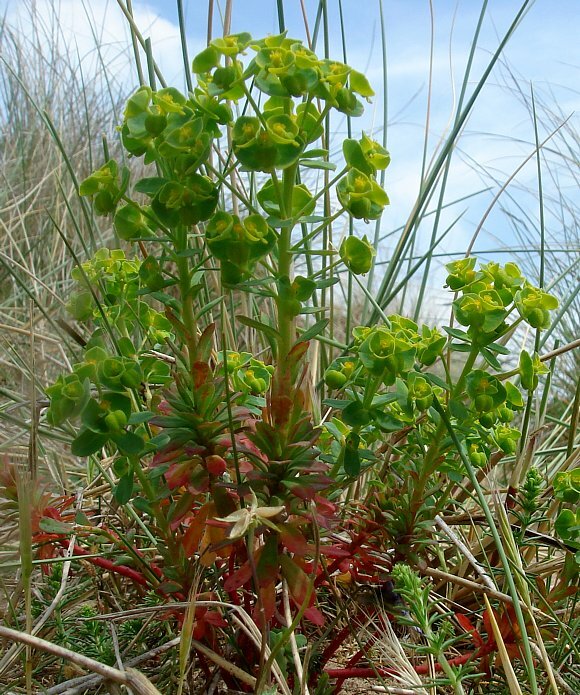 It was presumably first discovered in Euphorbia segetalis, a non-native Spurge. 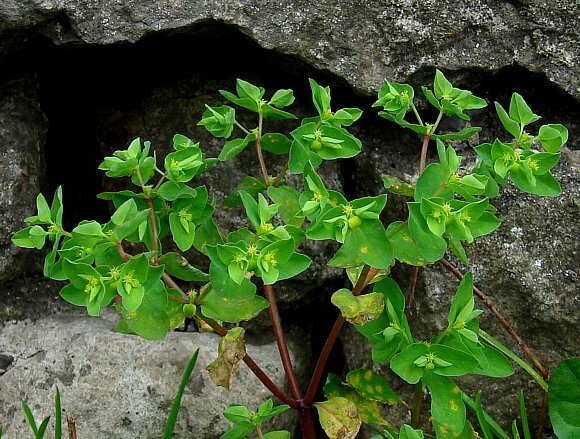 The Pepluane series are diterpenoids first found in Petty Spurge (Euphorbia Peplus) and have fused 5-, 6-, 5- and 6-membered rings. They too lack the cyclo-propane unit. 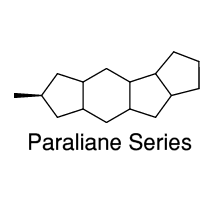 The Paraliane Series are diterpenoids first found in Sea Spurge (Euphorbia Paralias (from which they obtain their name) and have fused three fused 5-membered rings and one 6-membered ring. They too lack the cyclo-propane unit. 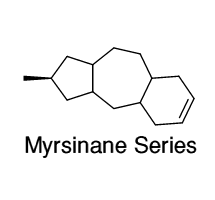 The Myrsinane Series are diterpenoids first found in Broad-leaved Glaucous Spurge (Euphorbia myrsinites) (from which they obtain their name) and have three fused fused rings - a 5-membered ring, a 7-membered one and a six-membered ring. They too lack the cyclo-propane unit.